Monday, April 10, 1911: I helped to wash this morning. Mistress Besse was out this afternoon and went with Miss Ruth out to gather some delicious dandelion. Ours was no good after all. Dandelion! Grandma’s diary entry reflects that excitement that fresh dandelion generated. Dandelion, endive, and other bitter greens used to be considered a spring tonic. People traditionally had a very limited selection of foods during the late winter months, and they really looked forward to eating fresh greens in the spring. When I was a child we often ate creamed dandelion served over mashed potatoes in the spring. I remember older relatives saying that they felt healthier after eating spring greens. 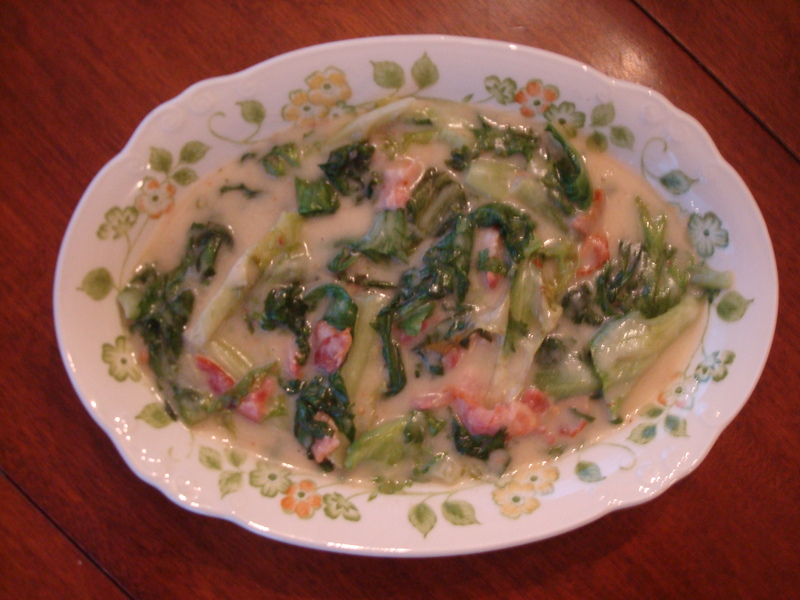 I seldom make creamed dandelion, but often make creamed endive. Endive tastes similar to dandelion, but it isn’t quite as bitter. Wash dandelion and tear into pieces; set aside. Cut bacon into pieces and fry until crisp in a large skillet. Stir in flour, sugar, and vinegar. Gradually stir in milk; heat until bubbly using medium heat. Reduce heat to low; stir in dandelion and cover for 1 minute. Remove lid and stir until wilted. Delicious when served over mashed potatoes. Posted on April 10, 2011 August 30, 2015 by SherylPosted in Food, recipesTagged dandelion, endive. This was amazing. Just what I was looking for. It’s going in my personal recipe book as 100 years ago creamed dandelions. The will live on in my kitchen – that’s for sure. Thank’s for posting them! Thanks for the nice note. I’m honored that you are including this recipe in your personal recipe book. I live in Ohio and Im 70 . Been eating this for over 60 years and have never been sick yet. This is what we call country food. We serve it over hard boiled eggs and red jacket potatoes. Old-fashioned country food is the best. I grew up eating it; ate it less as a young adult, and now am enjoying rediscovering it. Both my parents were Germans fron Russia. Thanks for stopping by. I recently discovered the Germans from Russia Foodways and Traditions Facebook page – and have been enjoying the recipes and other information.